Whe we hear about IoT, we think about spealized hardware. However, basic IoT is obtaining the output of sensor over the Internet from your room. 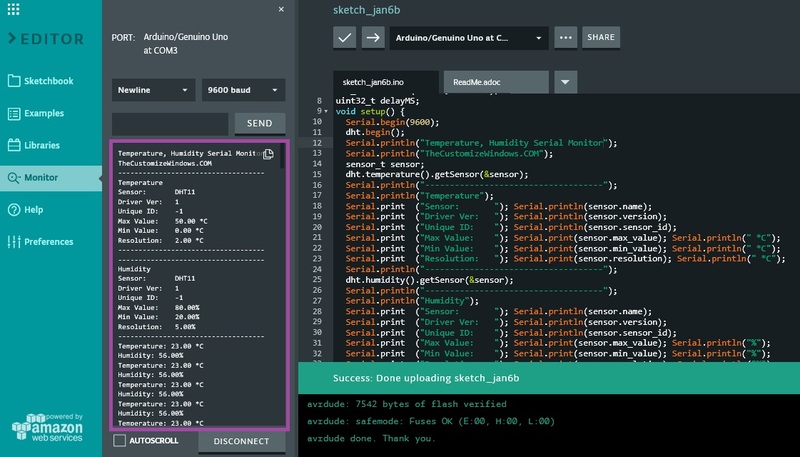 Using Arduino online IDE’s serial monitor is actually primitive IDE, although does not sound highly interesting or special. The temperature humidity reading on Arduino online IDE’s serial monitor is actually over the internet and with 4G/LTE connection it appears as “local”. Arduino With DHT 11 Sensor and Arduino Online IDE is Example of Basic IoT Which Needs No Special Hardware But Arduino, DHT11, Internet Connection & Web Browser. This is very easy project and good for understaning the logic, internet protocols, layers of OSI, how hardware interacts over the internet. This guide will also introduce the readers to Arduino Online IDE. We have guide with code for setup of Arduino Temperature Humidity Sensor like DHT11, DHT21, DHT22. Our previous circuit diagram and code is enough for this guide. That URL is protected via basic username-password authentication. Open that URL on another browser and login to access that serial monitor. You will able to live view that live reading. Even if you change your IP, it will work. You understood the thing. Arduino Create Platform is proprietary. This Article Has Been Shared 8425 Times! Here Is A Project Idea To Convert Analog Cooktop Knob To Servo Powered Timer Which Is Powered By Arduino. Hardware & Components Are Listed. Humans Have Discovered Yummy Tikka Kebab Circuit Design. How To Around Creating Circuits With Wire, Resin, Soldier And No PCB At China Price. Here Is Arduino 8 Digit 7 Segment LED Display Buying Guide. These Are Driven By MAX7219/MAX7221 Driver Which Supports LED Dot Matrix Too. Cite this article as: Abhishek Ghosh, "Arduino With DHT 11 Sensor and Arduino Online IDE : Basic IoT," in The Customize Windows, January 6, 2018, April 21, 2019, https://thecustomizewindows.com/2018/01/arduino-dht-11-sensor-arduino-online-ide-basic-iot/.